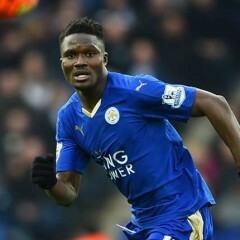 Daniel Amartey is a Ghanaian footballer for Leicester City in the English Premier League. Amartey has surely added bite to the crop of talented players in his team and offered competition in defense and midfield. Dan joined Accra Youth FC, the youth side of Inter Allies FC in 2009 from a Colts side Zinaps FC in Teshie a suburb of Accra. Zinaps was owned, managed and coached by his uncle Francis Amartey. He initially joined the team as a midfielder where he was nicknamed by his colleagues after former France legend and Real Madrid coach Zinedine Zidane for his quality passing distribution and ball control. He held the midfield role so superbly to the amazement of the technical handlers in the club. A change in the role of his position due to his versatility he was shifted backward in one game where a defender was hurt, he stepped in boldly to the defensive duties and controlled every aspect of the area until the end of the game. As an emergency defender, he played several matches in the position and cemented his place as the team’s reliable center back. He combined both duties and excelled fantastically and was forced to be promoted to the senior side. After spending virtually two years at the club’s junior side, Daniel Amartey was promoted to play with the big boys at the senior level in 2011 after some period of good and rapid development under the supervision of Technical Director Willie Klutse. The defender who can also play in the holding midfield position exhibited different qualities in leadership style for his short spell with the senior side. His command and humble authority skill commanded respect from his colleagues. He was an integral member of the team that qualified Inter Allies to the country’s topflight competition before he caught the eyes of clubs from Europe. From Inter Allies, Daniel Amartey started his European career with Swedish side Djurgarden IF. Magnus Pehrsson, the then Sports Director of Djuargarden was invited by Partick Mork, a licensed-player agent who longed admired the youngster after spotting Amartey play for Inter Allies. Pehrsson was convinced of the Amartey’s talent and decided to take him, Mork facilitated and played a vital role in sending the youngster to Djurgarden. After displaying world class performances for Djurgarden, Amartey moved to F.C. Copenhagen in 2014 and played 63 games. He moved to Leicester City in January, 2016 and part of the team that won the historic 2015/16 English Premier League title. He is currently with the former league champions and has had a feel of the UEFA Champions League.